It’s been almost three weeks since the midterm elections. Although the pundits on the talking heads channels are probably completely convinced they understand the historical significance of the results, the rest of us are still pretty confused. Big events, and even some relatively minor ones, require more time and context to fit them into history. But it was just one small step. The real work is still ahead. For one thing, we need to get all those new people who showed up at the polls to come back next year. The elections coming next year will be much lower in profile but potentially very important. In this area we will be choosing representatives for the state legislature, new county supervisors, and a school board. Decisions made by those officials often have more impact on day-to-day life than those at a national level. Similar votes will be going on all over the country. Then those new voters, and many more, also need to participate in 2020 and beyond. We still have too many indifferent citizens that must be convinced that their participation matters. Plus the millions who were excluded from voting by corrupt and greedy politicians who can’t hold onto power in any other way. All of that will require the new House of Representatives, and newly elected state and local officials, to decide that establishing a fair and transparent voting process for every citizen in every state is a top priority. No significant progress in any other area will be possible until that happens. Beyond that, the list of problems that have piled up during the Twitter/Facebook wars is staggering. Many people are calling for investigations of many people and events, egged on by a news media that thrives on political fights. Certainly that’s necessary, especially since Constitutionally mandated congressional oversight has been sorely lacking for the past two years. But just digging into the past won’t move the country forward. Unless those hearings and reports result in concrete plans to change the system, it’s all just noise. In the long run, making actual progress to improve life in this country for all will require leaders willing to articulate a clear vision for the future. Innovators at all levels, state and local as well as national, with the courage to explain and defend their ideas. With the skills to organize people to make them happen. And those of us not in leadership positions still have a role to play. We must pay close attention to what our representatives are doing in our name. When they are working for progress, we must let them know. When they are wrong, we must speak up and do what we can to push them in the right direction. All of that starts today, not at some vague point in the future. 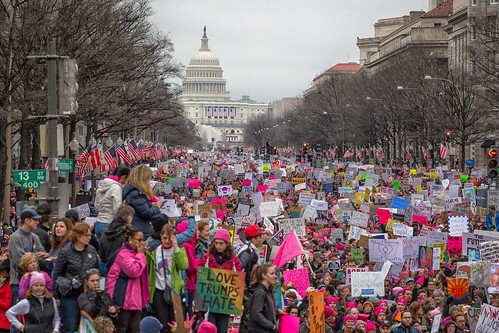 The image is of the Woman’s March on Washington, January 2017. Posted to Flickr by Mobilus In Mobili and used under a Creative Commons license. I expect more protest like this will also be necessary to move things forward. 1. Everything in this post is based, of course, on my personal view of where this country is and where it needs to be. You have every right to disagree. Politely. We here in the US are heading into yet another “election year” in 2016. And it would be nice if everyone kept these thoughts from the brilliant Charlie Pierce in mind as we withstand the flood of fear mongering from the candidates who want to lead us. If you want to see what losing the war on terror really looks like, don’t look to the Middle East. Instead, watch the television commercials approved by the various Republican presidential candidates. The three Democratic candidates are better, but not by much. The fact is that you can’t win a “war” on terror any more than you can win a “war” on hate or a “war” on any other easily activated human emotion, if there are enough powerful institutions that can profit from its activation. It’s really up to the rest of us, as active citizens in a self-governing republic, to keep things in perspective about the genuine dangers and the fantastical ones by which other people profit. There are genuine threats to our safety–bridges near collapse, gas leaks that may ruin a whole town, the unfettered access to firearms and the readiness to use them. That should be inspiration enough for We, The People to fulfill our pledge to each other to provide for the common defense and to promote the general welfare. John Quincy Adams was only half-right; if America goes not abroad in search of monsters to destroy, then it ought not to create them here at home, either. I wish we had more of those “active citizens”, instead of media-created “average” Americans. People who passively accept the ominously-voiced crap dispensed in 30-second bursts of political advertising as fact. Along with the ratings-bait fair and balanced “debates” that substitute for civic dialog in this country.